Uhm yeah, so maybe I did order something at the H & M after all. I bought a vest and a sweater at Takko Fashion earlier today, but you know, a day without ordering something at the H & M is like a sad day. Remember when I said I really liked this blouse, but I didn't buy it because I already wanted to buy two other blouses? And I wrote that 34,95 euros was a bit too pricey for my taste. 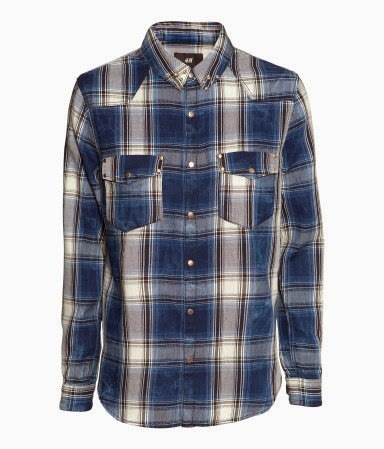 The H & M must have heard me, because this blouse is now on sale! For 20 euros, that price is good enough for me! 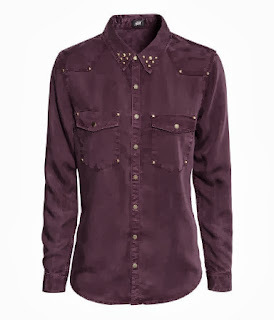 Especially because of the studs, it makes the blouse a little bit funky and edgy. I also used a 25 % discount so it was only 15 euros. That's right, 20 euros cheaper than the original price! This blue blouse was on sale as well. And I like it and then suddenly it was in my shopping bag. Oh well, whats a girl gotta do with it? The price was 20 euros in the sale, it was 34,95 euros originally. I used a another code, one with 5 euros discount. So basically no forwarding charges. In total I have to pay 34,90 euros. That's right, 0,05 cheaper than the blouses originally were. And that's including the forwarding charges. Gotta love the sale!